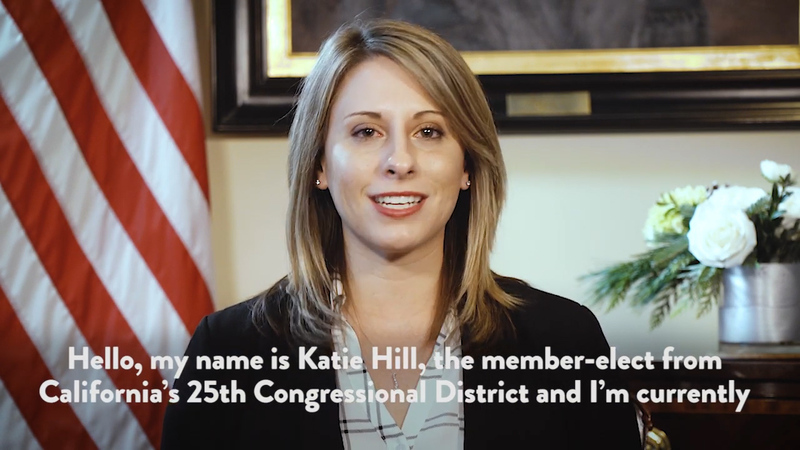 Congresswoman-elect Katie Hill of California’s 25th District delivers the Weekly Democratic Address. In addition to learning where things are and how to use the tunnels, we’ve done a lot of talking this week about where we go from here, now that we officially have a House majority. As the majority and as Democrats, we know that before anything else can happen, we have to repair the trust between people and our government. With that as the priority, under the Democratic Majority, H.R. 1 of the 116th Congress will be a bill that focuses on giving power back to people, not corporations or special interests. For most of the incoming representatives-elect, we ran for office so we could come to Washington to make the communities we represent the priority, and stop playing politics with their lives. That means removing voting obstacles, so that every vote and every voice is heard. That means passing true ethics and accountability reform, so that public servants honor the public trust and Washington stops being run by insider influence and starts working for the people again. That also means finally ending the dominance of big money in our politics and limiting the stronghold of corporations and special interests. H.R.1 addresses some of our toughest battles. It will establish automatic voter registration, strengthen the Voting Rights Act and put an end to partisan gerrymandering. H.R.1 also works to limit undue influence of big money by mandating more transparency and disclosure of political donations, fighting back against Citizen’s United, and creating a new 21st-century campaign finance system that empowers ordinary Americans. During this cycle, a record number of incoming freshmen refused Corporate PAC money – I was one of them. I did this because I wanted people to trust that at the end of the day, every decision I make and every vote I take is purely to benefit the people back home who gave me the opportunity to serve. That’s what government should be. When we get dark money out of politics, clean up corruption and ensure fair elections, we will earn the trust of the public so they know that we are working for them, not special interests or corporations. And with a system that works For The People, we will deliver policy outcomes that make life better for all of us: we will lower health care costs and out-of-control prices for prescription drugs. We will rebuild the United States’ infrastructure and put leverage back in the hands of workers and consumers. We will finally advance common-sense, bipartisan solutions to prevent gun violence. We will confront discrimination with the Equality Act , pass the Dream Act and take the first step toward comprehensive immigration reform. Now more than ever, this Caucus is committed to delivering for real people across this great country. We’re changing the game and we’re doing it by prioritizing legislation like H.R.1. I’m so excited to be a part of an incredible freshman class which is larger, younger and more diverse than ever before. Our class alone brought the median age of a Representative down by ten years and we have more women serving in the 116th Congress than in any previous session. These demographic shifts are not a coincidence – they are a call to action. We were elected to office because we aren’t insiders – we’re actually representative of the public we’re representing. People want change and they want it now. We don’t have time for party in-fighting and we owe our communities reform, so they can once again trust in their government to deliver for them when they need it most. I look forward to working together pass H.R.1, not just through the House, but to ensure our friends in the Senate know the stakes as well. Let’s get to work. Good for you, Katie!! We need a moderate Democrat to help lead the way for common-sense legislation on many issues. We will be with you all the way!! Finally (after 28 years of living in Valencia), a representative of the people taking her place among the incoming class in the 116th Congress. How refreshing.